Are you a dedicated home gardener with a little extra time on your hands? Do you need to find new ways to perk up your plants and enhance your veggie harvest? Honey bees are becoming endangered in the wild due to overuse of harsh gardening chemicals. Having a hive in your backyard is one of the most beneficial things you can do for the bee population. If you’re on the lookout for a new hobby, this article’s for you. Keeping bees is easy and you don’t have to live out in the country to do it. We’ll give you the lowdown on honey bee cultivation and help you with getting started beekeeping. The first decision you’ll have to make is where to keep your hive. If you’re planning on having more than one hive, start with one as a tester. You will need to talk to your local authorities or your homeowners’ association to make sure that your property is properly zoned for bees. You don’t want to have to deal with heavy fines or irate neighbors. Also, keep in mind that some people have serious allergies to bees and may be reluctant to have them around. If you’re planning on starting a hive during the spring or summer, you should start your inquiries by late fall or early winter. If you’re going to station your hive in your backyard, try to plant some bee-friendly plants like dandelions and sunflowers. Surrounding your beehive with bushes and plants will also encourage them to fly up and away from the hive instead of towards visitors. Bees also like to have some water nearby, so you might want to install a birdbath near your hive location. If you’re going to install multiple hives, try to have a bit of space between each one. Putting hives about 20 feet apart is a good rule of thumb: any closer and you run the risk of disease passing among your bees. Before you order and assemble your hives, it’s a good idea to contact your local beekeeping association. They can give you advice about which types of hives work best for your region of the country. You can learn how to order and assemble your hives online, but having someone give you guidance in person is a great idea. The most common type of hive is a Langstroth hive, and it costs about $300 online. A Langstroth hive has 10 internal frames and weighs close to 100 pounds when it’s full of honey. If you have a bad back, consider getting a smaller model with fewer frames. There are medium-sized boxes that weigh closer to 40 pounds and shallow boxes that only weigh about 30 pounds. Honey bee hives are usually made from wood, but there are plastic models available online. Try to get one with a clear front window so you can see your bees hard at work. Once you get your hive assembled, you’ll need some beeswax to rub on the top of the frame. That will encourage your bees to start building their honeycombs. There are six types of honey bees, and you’ll have to figure out which ones live best in your area. Again, your local beekeeping association will help you figure out how to start a beehive with the right type of bees. 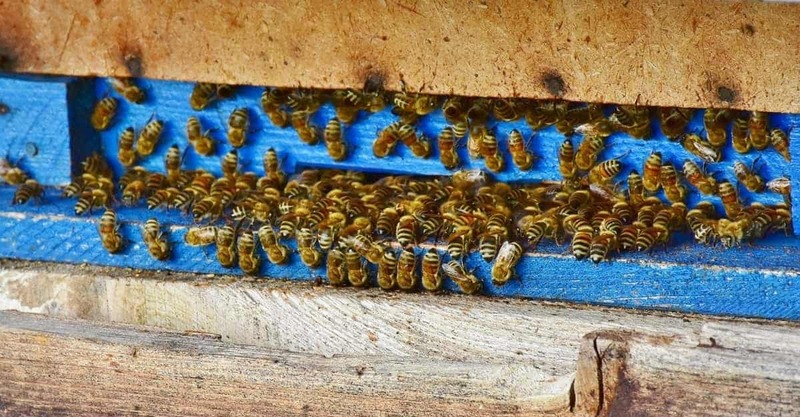 When you’re ready to order your bees, try to find a local “nuc,” or small group of bees. You can order honey bees online, but be extra careful when you open the package and wear your protective beekeeping clothing. The Italian honey bee is one of the most common types of bees you can buy. They tend to be more gentle, not prone to swarming, and disease-resistant. In general, however, try to source your bees locally. That way, you’ll know that you’re getting a sub-species that will be able to tolerate your local weather. If you have extreme winter conditions, you’ll need to invest in some insulation that goes under the outer part of your hive. One of the best reasons to start beekeeping is to get raw honey. If you’re committed to living sustainably and minimizing your impact on the environment, it’s a great feeling to have your own honey in the backyard. Raw honey can also help you get better sleep at night. Surprisingly, taking a few spoonfuls before bed can increase your body’s levels of tryptophan. If you have trouble sleeping, try to cut out caffeine after 4 pm. Take some honey around 6 pm and then again at bedtime. You can also add it to your tea for a soothing nighttime drink. Honey can also help improve your allergies and enhance your workouts. The natural glucose found in honey helps boost your energy and metabolism while you’re exercising. You can use honey as a facial moisturizer or even as a remedy for cuts and scrapes. Take a small amount of honey and dab it onto your wound, then cover with a band-aid. Honey works as an antibacterial agent and can help speed along your recovery. If you’re only getting started beekeeping, it’s a good idea to connect with a mentor. They can help you figure out what beekeeping clothing will work best for you and can help you use your smoker to keep your bees tame. With one active hive, you can expect to harvest at least 20 pounds of honey per year. You can sell that honey at your local farmer’s markets or give it away to friends and family. Under ideal conditions, a single hive could produce up to 50 pounds of honey each year. It might take a few seasons to reach peak production, but you’ll never want for honey again. We have a wide range of articles on health, beauty, lifestyle, and fitness. Come check out our blog and learn more about healthy living and weight loss!